Shocks, breathtaking performances, dramatic comeback efforts: spectators in De Haan have been treated to plenty of exciting moments to reflect upon so far and now the time has finally come to see which players will emerge victorious on Saturday 4th November as the 2017 ITTF Challenge Belgium Open officially closes. Masaki Takami and Yukiya Uda began their campaigns in the two-day qualification tournament which was hosted across Tuesday 31st October and Wednesday 1st November, finishing at the top of their respective groups to secure their places in the Men’s Singles main draw. Four rounds of fixtures later and now the two Japanese stars will meet face-to-face in the penultimate round of the main competition and as a result the final will feature an unseeded player fighting for the title. In contrast to the upper half of the draw, the other semi-finals encounter sees two seeded players do battle for a chance to compete in the gold medal match as Ricardo Walther takes on Kim Donghyun. Ricardo Walther, seeded second, doesn’t just carry the hopes of Germany on his shoulders but is also the sole European player left remaining in the title race and will require a strong performance against the eighth seed Kim Donghyun if he is to keep his trophy aspirations alive. Last year at the Belgium Open Yui Hamamoto enjoyed a positive outing in the Women’s Singles competition, finishing on the second step of the podium. The no.3 seed once again has an opportunity to reach the final, but first Hamamoto must negotiate a tricky semi-finals encounter. Polina Mikhailova provides the opposition and the Russian will enter the tie with plenty of confidence following her stunning display in the quarter-finals which led to the exit of the second seed Honoka Hashimoto. Regardless of the result in the lower half of the draw, Japan will be represented in the final with Hitomi Sato and Saki Shibata meeting in the other semi-finals tie. 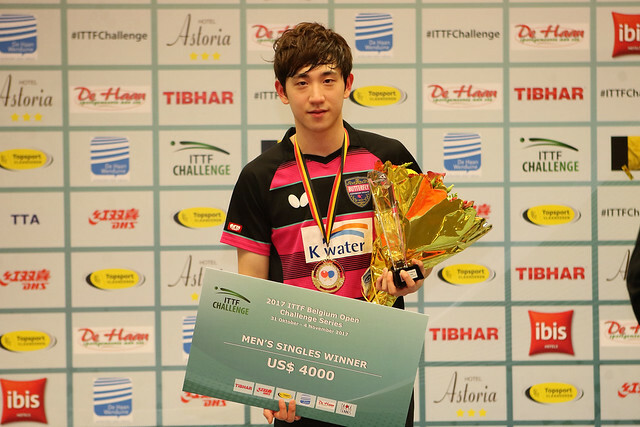 Sato came out on top when the two players met at the ITTF Challenge Series event held in Belarus but will it be a repeat outcome in Belgium? Two further tournaments will conclude on Day Three with the Men’s Doubles and Women’s Doubles trophies up for grabs. Germany’s Ricardo Walther and Patrick Franziska will team up in the Men’s Doubles final as they attempt to topple the host nation’s Robin Devos and Cedric Nuytinck. Over in the Women’s Doubles final Korea Republic’s Lee Zion and Song Maeum, who occupy 22nd position in the seeding list, take on the top seeded Japanese partnership of Honoka Hashimoto and Hitomi Sato.